…Maxwell Evarts Perkins was born. Descendant of two signers of the Declaration of Independence, he was always described as more New England Yankee than New Yorker. After graduating from Harvard with a degree in Economics, Perkins worked for a bit as a reporter at the New York Times, then joined the well-respected publisher Charles Scribner’s Sons in 1910 in the advertising department. Within a few years he was moved to the editorial side, and began his long tenure as a legendary spotter of talent. Because of Perkins, Scribner’s published those Paris ‘such friends’ F. Scott Fitzgerald, and Ernest Hemingway, as well as Thomas Wolfe and other distinguished novelists from the beginnings of their careers. What can we learn today from the way Perkins worked with these outstandingly creative people? That’s the question I asked when working on my MBA thesis at Duquesne University. 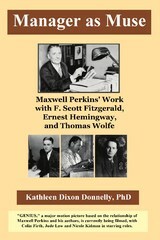 The result is Manager as Muse: Maxwell Perkins’ Work with F. Scott Fitzgerald, Ernest Hemingway and Thomas Wolfe, which I have recently slimmed down and published on Amazon, in both print and Kindle versions.